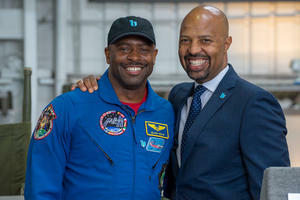 COSTA MESA, CA, February 07, 2019 /24-7PressRelease/ -- Leland Melvin, the only person drafted into the NFL to also have flown in space, will be the official spokesperson of the Base 11 Space Challenge. As the public face of the $1 million+ student rocketry competition, Melvin will focus on fostering greater diversity in science, technology, engineering and math (STEM) fields, and in aerospace in particular. "Hands-on learning experiences are critical to excelling in the 21st century workforce, and we need to exponentially increase those experiences at universities across the country," said Melvin, who completed two Space Shuttle missions. "The Base 11 Space Challenge is going to help ensure that the next generation of space innovators is just as diverse as America is — all with the excitement of teams flying to the edge of space." Last fall, 32 university teams officially registered for the Base 11 Space Challenge, which will award $1 million to the first student-led university team to design, build, and launch a liquid-propelled, single-stage rocket to an altitude of 100 kilometers, the edge of space, by December 30, 2021. Additional prizes worth $150,000 are available along the way. "We are inspired by the enthusiasm with which students from across the US and Canada have embraced this audacious challenge," said Landon Taylor, CEO of Base 11, the nonprofit parent company of the National Rocketry League, LLC, the official sponsor of the competition. "Once again, Base 11 is breaking down silos between academia, industry and philanthropy to create innovative workforce development programs." Bank of America Merrill Lynch forecasts that the commercial space industry will be valued at $2.7 trillion by 2035. The mission behind the Base 11 Space Challenge is to dramatically increase the STEM talent with greater inclusion of women and underrepresented minorities, while empowering the future workforce with the education and skill-training necessary for jobs in the aerospace and related industries. When it was first announced in June 2018, the concept of the Base 11 Space Challenge attracted immediate interest from innovative aerospace, engineering and technology companies. Dassault Systèmes US Foundation signed on at the highest level, as a Chairman's Circle Partner. Blue Origin, SpaceX and Firefly Aerospace all joined as Platinum Level Partners. In March 2019, teams will submit their overall design for their rocket, as well as full program design, including how they will fund their project, recruit new talent to sustain the project as teammates graduate, and conduct outreach in the community to increase awareness of STEM opportunities. All of the teams listed above attended a mandatory Base 11 Space Challenge Safety Training in October 2018 held in three locations, Long Beach, Calif., West Lafayette, Ind. ; and Toronto. The training which featured presentations from safety experts at NASA, Zucrow Labs, Pratt & Whitney, Boeing, Cal State Long Beach and the Friends of Amateur Rocketry. To learn more about the Base 11 Space Challenge, visit www.base11spacechallenge.org. Base 11 is a non-profit public benefit corporation focused on empowering high-potential, low-resource community college students with hands-on education and training in STEM-related enterprises. Base 11 partners with community colleges and their feeder high schools to provide high-potential, low-resource students with real-world training, experience and mentorship in STEM-related enterprises, delivering to employers a prerecruitment pipeline of well-trained, highly skilled STEM employees and entrepreneurs. For more information, please visit www.Base11.com. Base 11 is a DBA of the Center for Innovations in Education, a non-profit 501(c) 3 - IRS exemption EIN# 26- 4365936.